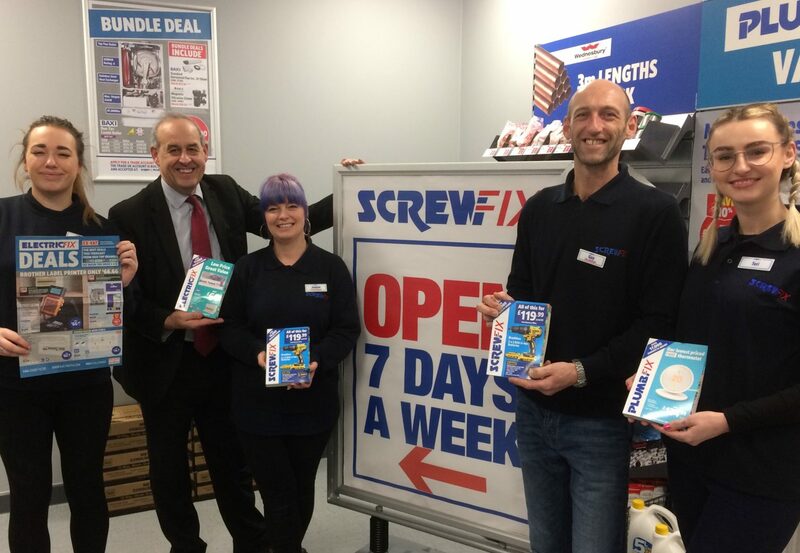 Last week I visited the new Screwfix store in Flint to meet new staff and welcome the business to the area. Screwfix will open its new store on Thursday 14 February 2019 and will be offering 10% discount on opening. Screwfix is the UK’s largest multi-channel retailer of trade tools, accessories and hardware products. It was founded in 1979 as the Woodscrew Supply Company, the company was acquired in July 1999 by Kingfisher PLC, who also own B&Q, and is listed on the London Stock Exchange. Nationally, Screwfix employs 7,131 people (2017) and the new store in Flint has brought with it more jobs. It is excellent to welcome a new retailer to Flint. It will provide our town with jobs and ensure that those who need access to top-quality tools and equipment will be able to use a local retailer. This can only be good news for our town’s economy. Going forward I want to see us build upon this good news. When towns up and down the country are struggling we need to look at the success stories so that we can learn and adapt them for ourselves. We have seen in Holywell how its digital high street initiative is supporting local businesses and how Mold is working hard to attract tourists through its heritage. Flint is a hub of history for North Wales, with talented and skilled people. Businesses would be hard pressed to find a better area to locate themselves in.